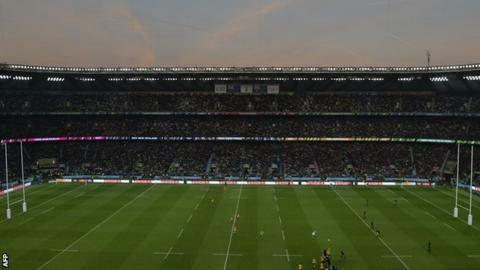 The first NFL match to be played at Twickenham will feature St Louis Rams on 23 October next year. This month the NFL and RFU unveiled a partnership for the home of English rugby to stage at least three regular-season games over a three-year period. The Rams will play the first of those against opponents yet to be decided. Also as part of the 2016 International Series, the Jacksonville Jaguars will return to London for a fourth consecutive year to play at Wembley. The NFL's scheduling formula will see St Louis face the Philadelphia Eagles, Dallas Cowboys, New York Giants or Washington at Twickenham in south-west London. At the national stadium in the north-west of the capital, the Jaguars will face Indianapolis Colts on 2 October, and Wembley will also be the venue for the Cincinnati Bengals' first game in London, against the Washington Redskins on 30 October. Wembley hosted three NFL matches during 2015, with October's fixture between the Buffalo Bills and the Jaguars played in front of an 84,021 crowd. London will also play host to regular-season games at Tottenham's new stadium from 2018.